Once a year, friends and I organize a girl's weekend to eat, drink, and catch up with each other's lives. We act like we are 25 again for a brief moment, except we have money now to actually eat at nice places and not be limited to the bar with $2 draft night. It is always one of my favorite trips of the year. Last year, it was Asheville; this year Greenville, SC. 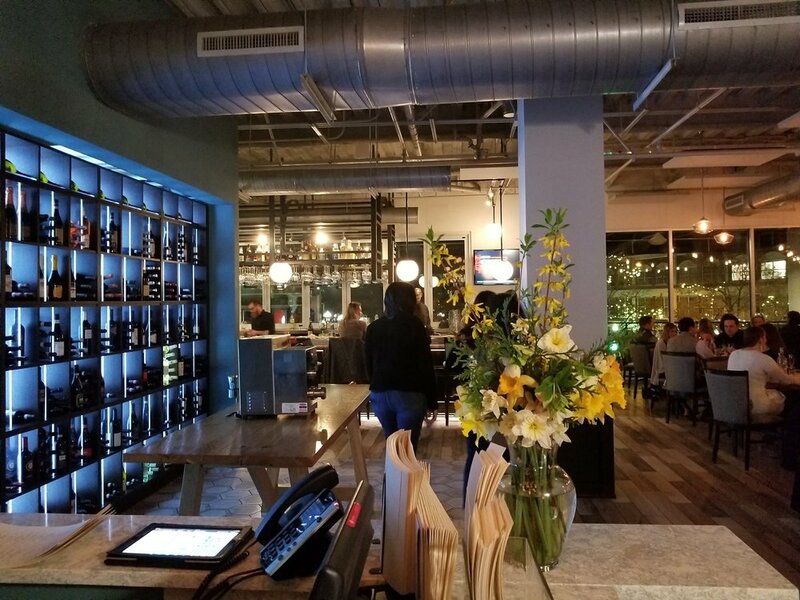 Greenville has been on the trendy radar for some time, and I have seen it mentioned in multiple travel magazines and blogs for its vibrant food scene and beautiful use of the riverfront downtown. You’ll also find a lot of outdoor activities in town and nearby. Since we have foodies and outdoorsy people in the group, Greenville seemed like a perfect fit. I was particularly interested in the Swamp Rabbit Trail, a 20 mile paved bike trail running through downtown. I love exploring a city by bike. The trip turned out fantastic. We ate, we biked, we shopped, and we hiked in our 3 day weekend and never felt we were squeezing in too much. By the second day, all of us were really impressed with Greenville. It appears that every building is new and there is a lot going on for a city its size. Take a look at this town if you are searching for a long weekend vacation destination. If you decide to stay in a hotel, I would definitely pay the extra money to be downtown. You can drop your car off in a garage and not look at it again until you leave, unless you decide to drive to the nearby mountains. Main Street really is the main street downtown, for 5 or 6 blocks on either side of the Reedy River. Stay as close to it as you can afford. Most downtown places will be about $250 a night for a family of four. And parking is generally extra. Hampton Inn & Suites Greenville Downtown @ RiverPlace. This hotel is right downtown along the Reedy River (in fact, in can be seen in the picture at the beginning of this blog). Breakfast included. Home2Suites Greenville Downtown. I really like the Home2Suites brand in general because the rooms are a generous size and have a mini- kitchen area. This one is at the north end of Main St but still close enough to walk to everything. Breakfast included. The Westin Poinsett. This hotel is a Historic Hotel in an older building with a 1920's themed decor. It is known for its service and is a slightly fancier (and more expensive) option downtown. No free breakfast. Swamp Rabbit Inn. This bed and breakfast has 6 rooms (all with private bathroom), a community kitchen they keep stocked with breakfast supplies, and a fun, quirky attitude. Rent out the entire place and have a family reunion. 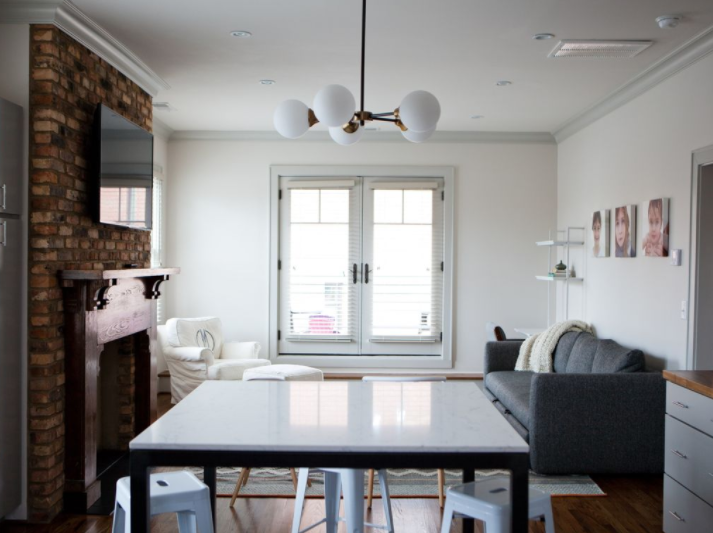 If you decide to rent an apartment, we found an absolute winner in Stylish Downtown House Near Fluor Field Suite B. Sarah was a fabulous host, immediately answering emails, and gave us great advice on where to eat as well as activities in the area. The apartment was spacious and clean, within walking distance of Falls Park on the Reedy (0.5 miles), and 1 block off of Main Street in the trendy West End of Greenville. It rents for an average of $150 a night. It had plenty of room for the 4 of us and lived up to its name with its cool, modern but cozy, decor. It also has a washer/ dryer if you are staying for an extended period. We would stay again in a heartbeat. Sarah also rents the downstairs apartment, Stylish House Near Fluor Field Suite A, if you would like more than one bathroom. Or rent both apartments and come stay with a group. All of us thought that would be a super fun idea for next time. This park rightfully tops just about every list of "Things To Do in Greenville" that you’ll find online. Walk across the super cool, suspended pedestrian bridge, then explore the gardens below. There are flowers, open green space, ducks, and of course, the Falls to admire. It is very hard to believe that a 4 lane highway was once here and kudos to every civic leader who had the vision to see this park instead. Cross over the Reedy River and walk north on Main Street. On the left, next to the Westin Hotel and Nose Dive Restaurant, look for the boar drooling water out of his mouth. He is officially known as 'Il Porcellino' and is a recreation of a famous statue in Florence, Italy. The legend says that if you place a coin in his mouth and it falls below, your wish will be granted. If you rub his nose, you will have good luck and return to him one day. We rubbed and continued on our way. So I guess I need to go ahead and start planning my return vacation to Greenville? If you like the scavenger hunt idea, look for nine, very small, bronze mice sculptures scattered around the next few blocks of Main Street. A high school student's idea for his senior project, these mice are based on the nine mice found in Goodnight Moon, a book he loved as a child. Each mouse has a name and is related to the others. Read more about the history and get some location hints from VisitGreenville. If you aren't into scavenger hunts, then just stroll up Main Street towards Springwood Cemetery to window shop. There are a plethora of local clothing boutiques and art galleries, as well as larger stores, such as Brooks Brothers or Anthropologie, that make for good window shopping. Definitely stop at Mast General Store, which is one of my all time favorite places because it has good outdoor clothing equipment and huge barrels of candy. Because those two should always go together really. You’ll aslo find a really fun toy, O.P. Taylor’s store at 117 N. Main Street. If you have kids, head for Linky Stone Park, at the underpass of Academy St along the Reedy River. The park is about a quarter of a mile from The Falls Park along the Swamp Rabbit Trail, a pretty walk along the Reedy River. The park doesn't have a playground per say, but it is labeled as a kids discovery park. Younger kids can explore some sculptures, a small rock garden, and some giant percussion instruments. Probably not that fun for kids over 10, but the flowers and pretty setting along the river still make it a nice excursion. A rails to trails project, the Swamp Rabbit Trail is my favorite thing about Greenville. I love to get out on a bike, and this is an easy trail to do it. Set away from any roads for the most part, and running right through downtown Greenville, the Swamp Rabbit Trail can be done by just about anyone. Start early-ish (maybe around 10am) and bike to the small town of Travelers Rest for lunch and a beer. Gaining only about 200 feet in the 10 miles between Greenville and Travelers Rest, it took us about an hour and 15 minutes to bike each way, at a leisurely pace. Rent bikes at Reedy Rides, just off of Main St on McBee Ave. They were super friendly and had decent bikes for adults and kids (a rarity!) costing $20 for 4 hours. They even had electric bikes if you just want to cruise your way to lunch and trailers in case you have a kid who just wants to cruise. Reserve ahead of time for weekends or during the summer. If Reedy Rides is booked, there are several other rental places in or near downtown Greenville: Bike The Rabbit, Pedal Chic, and SRT Bike Shop. From Reedy Rides, it is just 0.25 miles to join the Swamp Rabbit Trail as it crosses under River St. Turn right towards Linky Stone Park and then follow the signs north to Travelers Rest. See the map at the end of Day 1. It isn't the most scenic ride out of town but the trail is nicely paved and wide. After a few miles, it becomes mostly forest. The mighty Reedy River on your way out of town. The trail does cross a few 2 and 4 lane roads but the crossings are well marked. Not every driver stops to let bikers and pedestrians across but for the most part, they were pretty courteous. Public bathrooms are located along the trail but not very frequently. They are marked on the official website's map but basically you'll find them at: Falls Park on the Reedy, at Swamp Rabbit Grocery and Cafe, Furman University, and at the public park in Traveler's Rest. At about 2 miles north of River St where you started, you will see Swamp Rabbit Cafe and Grocery on your left. This eclectic place has a bit of everything; a grocery store that focuses on local meat, produce and beer, a cafe with fresh sandwiches and baked goods, and a wood-fired pizza place open on weekends. If you have toddlers, you will love it as they have a large fenced area filled with toys just for them. For a shorter ride, you could just bike here, stop for awhile, and call it a day. The Swamp Rabbit Cafe and Grocery. As you can see, they are very kid- friendly. At about 6.5 miles from where you started by River St, you will see an entrance for Furman University on your right. You can detour down to the path by the lake to get a better look at the beautiful campus but this path does not connect back to the bike trail. You can either back track to your entry point or off-road it a bit across a grassy section to cut back to the Swamp Rabbit Trail. Furman's gorgeous campus. You can bike down the lakeside path a ways and then cut across (and up) a grassy bit to your left to get back to the Swamp Rabbit Trail. At about 9 miles after you started on the Swamp Rabbit Trail on River St, you will enter Travelers Rest, SC. Named because of its history as a stopping place for drovers after they crossed their cattle over the mountains, it is now a popular place for tourists and locals biking or driving up from Greenville. There are restaurants, cafes, a brewery, and a few stores along the main drag, which runs next to the Swamp Rabbit Trail. Everything mentioned below is easily accessed from the bike trail. The bike trail through Travelers Rest. That's the Whistle Stop Cafe on the right and there are lots of other places next to it or across the street. Lunch stops don't get much more convenient. We had a beer first at the Swamp Rabbit Brewery and then meandered over to the Whistle Stop Cafe for lunch. Both places get two thumbs up. The brewery usually has a food truck starting around noon on Saturdays (and often on Sundays as well - check their website) and the beer is really good. Whistle Stop at the American Cafe has been around since 1945 and is named because the conductor would whistle for a stop at the American Cafe as the train came through Travelers Rest. It has been owned by the same family since then. The restaurant has a great rooftop area, a miniature train that chugs around the interior, and a red caboose out back (right next to the Swamp Rabbit Trail) that serves ice cream and milkshakes. This place is very kid-friendly. You can see the caboose that sells ice cream on the right. There is a miniature train that circles above the bar area and the rest of the place is chock- a- block with memorabilia. We ate at Sidewall Pizza (the next day) and it was fantastic as well. Sidewall has 2 other locations in Greenville, and it seems to be a bit of an institution because multiple locals told us we had to have pizza at Sidewall. The Travelers Rest location is the original though. Yummy pizzas, good craft beer selection, and huge salads hit the spot after a morning hike. It isn't the biggest place indoors so I can see this having a wait in the summer and on weekends. If the weather is nice, you can always dine al fresco. The place has a large, covered area with picnic tables. Other restaurants in Travelers Rest that were recommended to us were The Cafe @William's Hardware, Upcountry Provisions (get a sandwich to go and take it over to Swamp Rabbit Brewery), and Farmhouse Tacos. Get on the Swamp Rabbit Trail going north (right) at River St and head north 2 miles to Swamp Rabbit Cafe and Grocery (mentioned above). Turn south (left) on the Swamp Rabbit Trail and bike about 1.6 miles to Cleveland Park. See the map from Day 1. This is a very scenic section of trail, crossing the Reedy several times. Stop for a minute about halfway to Cleveland Park and brush up on a little Cold War History at the large airplane at Rudolf Anderson Memorial Park. The plaques will tell all about this Greenville native, whose U-2 spy plane was shot down over Cuba during the Cuban Missile Crisis. Pack sandwiches from one of the many cafes in downtown and have a picnic in Cleveland Park, which has a few picnic shelters and covered picnic pavilions. You'll find 2 good playgrounds in Cleveland Park, right outside the Zoo Entrance. One is geared towards for younger kiddos ages 4- 8 and the other for ages roughly 8- 13. *** If you have kids, the Greenville Zoo is right off the trail by Cleveland Park. It isn't the biggest Zoo but that almost makes it better for younger kids as it doesn't take too long to see everything. It is also very reasonably priced. Falls Creek Falls is a 1.7 mile (3.2 RT) hike to a beautiful, 125 foot waterfall but it is not an easy stroll. The trail climbs 600 ft in this short distance but just when you think you can't climb anymore, you are rewarded with an up close view of the huge waterfall. I would say anyone in reasonable shape could do it, just take your time. When you get near the falls, keep an eye out for the orange blazes that mark the trail. The trail curves around to the left and down to the falls themselves, but there is another trail that takes you up past the falls to an overlook at the top. If the falls are on your left and you are going straight up a less well- trodden path, you might have missed the turnoff. We did on the way up but caught the turn-off on the way back down. The trail does cross Falls Creek once so waterproof hiking shoes come in handy, although everyone else in my group had trainers on and managed to rock hop across. It took us a little over 2 hours to complete the hike, but we also hiked up beyond the falls to the overlook. It was a gorgeous spot, although I am not sure it would be worth the hike up in any other season besides winter as the leaves would obscure the view. View from the top if you keep going up the trail beyond the falls. 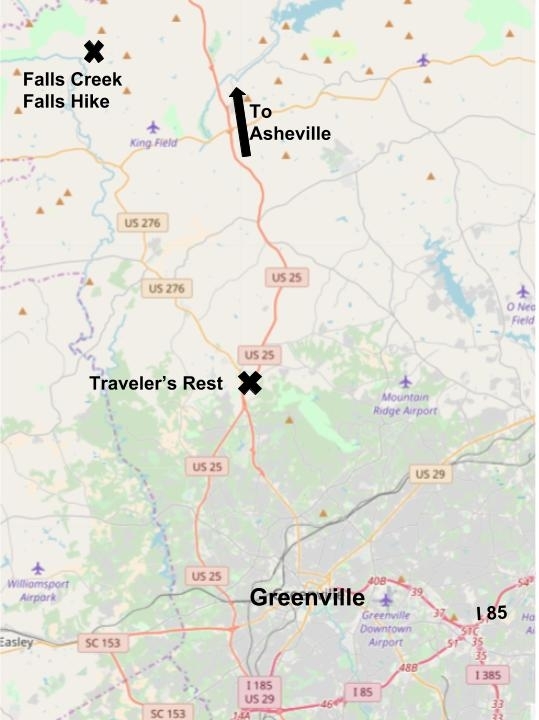 It takes about 45 min to drive from Greenville to the trailhead. Use GPS or Google maps to get there as there are a number of turns. Input Palmetto Bible Camp, Marietta, SC as your destination. Once you drive past the Palmetto Bible Camp, the trailhead is a few hundred feet beyond on your left. You must fill out a short form with your name, the number of people in your group, and emergency contact at the trailhead sign seen in the picture. Have lunch in Travelers Rest on the way back into Greenville as it is about halfway and there is not much near the trailhead. *** Don't be confused with another waterfall in South Carolina near the Georgia border called Fall Creek Falls. The "s" on the first word is very important as the trail you want is called Falls Creek Falls. If they start talking about 3 waterfalls in succession, you are on the wrong website. Greenville has an amazing number of restaurants, breweries, cafes, bars, et al, considering its size. Our Airbnb host gave at least 20 places when we asked for recommendations and we did our best to hit as many as we could in 3 1/2 days. I could easily come back for a week though to try and eat at all the places I wanted to. ***This was a kid-free trip so we were eating a little more upscale than normal. There is no shortage of kid-friendly places in downtown Greenville though. Tupelo Honey and Barley's I know are great from past experiences at other locations but there were many other, local, places I would have tried. Jianna is an Italian and oyster place in a modern, minimalist setting. It is on the second floor and has a beautiful outdoor deck overlooking Main St that was unfortunately too cold for us to enjoy. They make all their pasta in-house and I would definitely head for the pasta dishes. (One of our group had a non-pasta fish and it was blah.) The short-rib rigatoni, however, and my gnocchi starter, were delicious. The burrata appetizer was also a winner. We inhaled that. 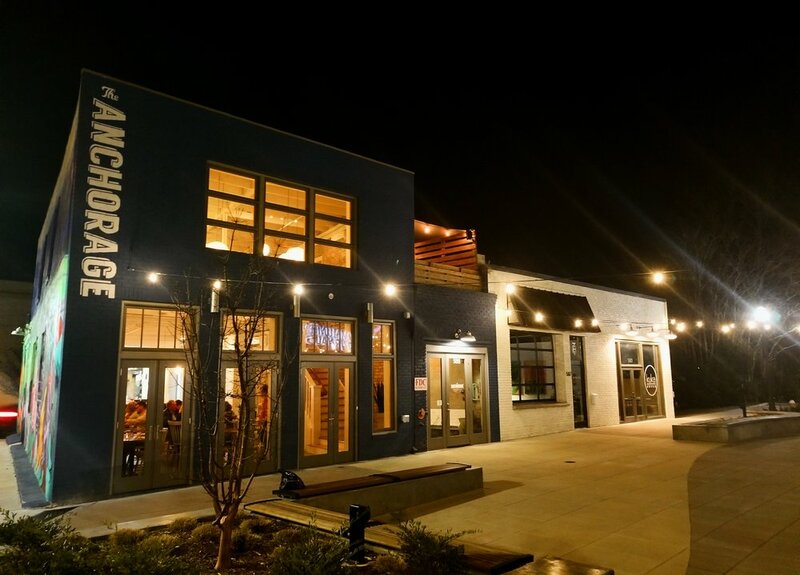 Anchorage is a new restaurant in the Village of West Greenville, 1.5 miles west of Falls Park downtown. Open for dinner and Sunday brunch, this place focuses on small plates for sharing, great cocktails, and a good wine list. Anchorage is popular, and doesn't take reservations, so there can be a wait. We were fine at 530pm on a Thursday but it got busier as the night went on. Part of the reason for its popularity is because it was recently named a James Beard semifinalist. ***There are several restaurants and bars grouped together on this section of Pendelton St so if the wait is too long at Anchorage, there are other options. The Lazy Goat is an upscale Mediterranean place. There's pasta, paella, shawarma, charcuterie, and lots of cheese on the menu. My butternut squash was fantastic as was the fried goat cheese. The dining room has great views of the river (especially pretty at night with the lights) but the outside patio is the best if the weather cooperates. They serve an intermezzo menu in the afternoon that would be perfect for a stop as you walk/ bike through downtown on the Swamp Rabbit Trail. Other fancy places mentioned to us that we never had a chance to get to were Larkin's on the River, Pomegranate on Main, and Trattoria Giorgio (closed Sunday and Monday). More casual restaurants recommended to us were Grill Marks (burgers), Chicora Alley (burgers and mexican), and Takosushi (far east meets southwest). All of the above resturants are on Main St but close by there are even more options. You might also try Golden Brown and Delicious (burgers, sandwiches, noodles, fried things that can be described as golden brown), and we were specifically told to try the sweet potato cake at Brick Street Cafe. Many places claim to be a speakeasy but Vault and Vator really felt like one as we had to get help from a passerby to find it and still had trouble finding the actual door. It is around the back of the Great American Cookie Co on Main St and the door has a tiny sticker on it with the name. Once inside though, it is a very chill place with some great cocktails. There are no cell phones, standing, or fireball shots allowed. This is a place to sip and talk. It's on my list to return to because I really liked the vibe. I loved that there are Tintin comics all over the bathroom in Trappe Door, maintaining that Belgian theme. The Trappe Door is another basement bar (this time underneath Barley's) with great cocktails featuring homemade ingredients. But they also have food, as well as a huge selection of beer, including lots of Belgian beers. And they let you use cell phones. There are lots of other places on Main Street for a drink, but these two stood out for me. Stone Pin Company is one of those new, hipster bowling alleys, with really good food and craft drinks. Under 21's welcome until 8pm. Flour Field is the home the Greenville Drive, the single A affiliate of the Boston Red Sox. It is just off of Main St and is a nice, new stadium perfect for catching a minor league game. Saturday Market closes down Main St at McBee Ave from May- October. You can find everything from produce to clothes to candles. If it is sold on Etsy, then there's a good chance you might find something similar here. The Children's Museum of the Upstate (closed on Mondays during the school year) looks like a neat little place for kids to explore. There are waterworks, hands on science exhibits, and a very cool looking, multi-story climbing structure. Seems more geared to kids under 12, but I haven't been there. The Runway Park at GMU is a playground located by one of the runways at the Greenville Municipal Airport. Not only can you watch small planes take off and land, but all the playground equipment is aviation themed. I immediately thought of several kids who could spend all day here. 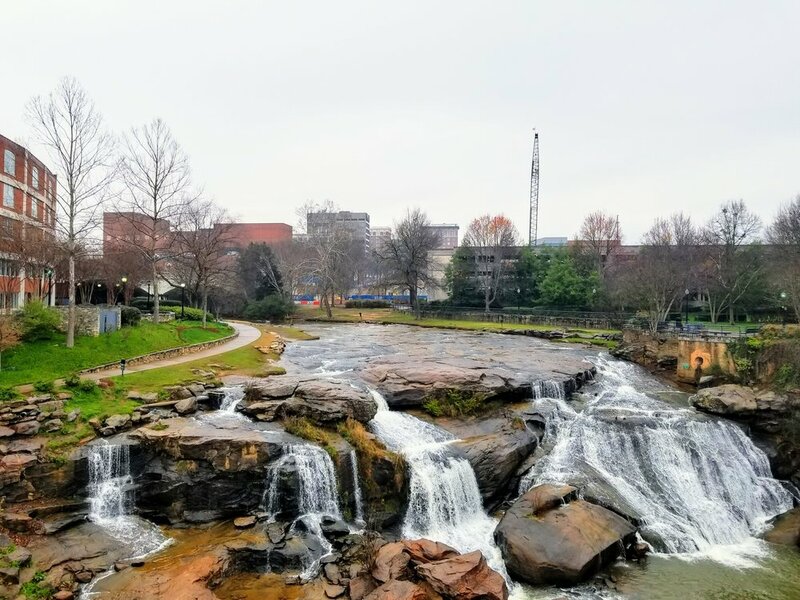 If you are looking for a fun weekend away, somewhere to get outside but also enjoy good food and drink, then you really can't go wrong with Greenville, SC. It might be surprising to some of you (I was) but Greenville has changed a lot in recent years and deserves its current reputation as a foodie town and for outdoors recreation. There's a reason VisitGreenville picked #yeahthatgreenville as its motto. Definitely check it out, you won't be disappointed. To see all the pictures from my Greenville adventures, check out the album on our facebook page. Asheville makes for a terrific family weekend. It's an architecturally appealing, fun, artsy town with great restaurants and what seems like a craft brewery on every block. It’s also surrounded by the Blue Ridge mountains with scenic hikes and has a river perfect for floating. Currently only available on Amazon. Brevard, NC is a charming mountain town filled with shops (including a great toy store), restaurants, antiques, and art galleries. It’s also home to Dupont State Forest, which offers plenty of hiking and mountain biking trails to explore. The Hunger Games movie was filmed at Dupont where you can visit Triple Falls, the most recognizable mountain scenery in the movie. Bryson City is a fun outdoor town with something for everyone. Its downtown has quaint shops and restaurants, and the Great Smoky Mountain train depot resides right in the heart of it. Within a 20 minute driving radius of town, you have great lakes to swim or canoe, rivers to raft, and hikes to waterfalls. Throw in a brewery, a bookstore, an outdoors store, and good restaurants- you just can’t beat it. You won’t have any trouble filling your weekend with fun in Louisville, whether you are here in winter or summer, rain or shine, or you have teenagers or toddlers. There is a plethora of activities, from hands-on museums to underground zip lines, and lots of tasty restaurants to try. But maybe the best thing about Louisville is its fairly compact size-- most attractions are within several blocks of each other, making your sight- seeing a breeze. Park the car for the weekend and enjoy yourself in this awesome city!